title="I have never seen a work of fiction so perfectly capture the out-of-nowhere shock of discovering that you've just bricked something important because you didn't pay enough attention to a loose wire." So I guess I should really read this book, huh? The answer of course is that it wasn't on Earth that it happened. It was on Mars. More seriously, this sounds cool and I may have to read the book one day. I can't wait to see the movie, but even more to read the manual. I don't know what your native language is, Plutarch - knowing that you live in the same great city as me doesn't help at all! - but you've reminded me of the phrase "shitting bricks", meaning "feeling extremely afraid". This was common in my youth in Northwest England, and was often mutated into "bricking it". orthogon wrote: I don't know what your native language is, Plutarch - knowing that you live in the same great city as me doesn't help at all! - but you've reminded me of the phrase "shitting bricks", meaning "feeling extremely afraid". This was common in my youth in Northwest England, and was often mutated into "bricking it". The alt-text (spoiler-ish alert) does in fact refer to one of the events in the book. I did enjoy the book, even if it's kind of a mashup of a futuristic Robinson Crusoe and a "Golden Book Planetary Survival Guide , Volume 4: Mars"
Read the book, don't watch the trailer. There be spoilers there. 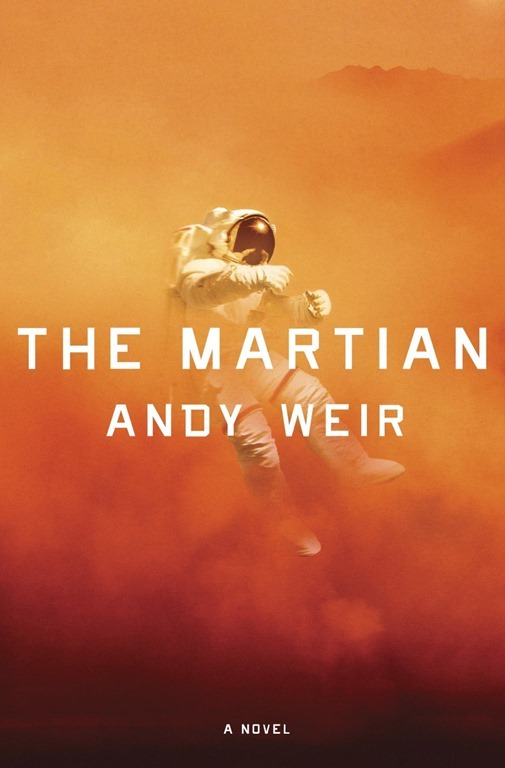 As a connoisseur of audiobooks, I have to say that the audiobook of "The Martian" is Excellent. Very well read. BlitzGirl wrote: Yes! Read the book! It's real? I couldn't tell either way from the comic. The book is hugely funny, and a great My Side of the (Martian) Mountain survivalist read. You'll give yourself all the cool kid points when you see an issue or a solution before he gets to it. I think Matt Damen will do a great job, and the film will be hilarious and interesting and fun. I'm driving across the Arabia Terra right now, so I'm getting a kick out of t|░▒▓ CONNECTION LOST ▓▒░. The film is likely to be the #1 film of all time in Latvia. Man survives over 500 Martian days (SOLs) with eight potatoes, he is live the Latvian dream. I have no potato, just dream of potato. I work part-time at Barnes & Noble (more a paid hobby than an actual job). I read an advanced reader copy three or four months before it was originally released, and loved it. (Which is sorta why they send us the ARC.) Been 'hand-selling' the crap out of it ever since. It was great. Funny, tense, exciting, funny.... It really seemed real. Well worth your time. Quite looking forward to the movie. Novels rarely make good movies - they have to leave to much out. But I think in this case, a lot of the exposition will turn to action, which should eliminate most of the "but, they left out my favorite part" you usually get. Question about the book - I loved it, but one guy was bitching on some forum that he put it down after a few pages, because there's no way a wind on nearly-airless Mars would have a chance of blowing over a ship or much else for that matter. Now, this seemed an odd quibble, and I suspect there was some other reason for his hatred for the book, but I wondered if he was right or not. Anyone? Jackpot777 wrote: The film is likely to be the #1 film of all time in Latvia. Man survives over 500 Martian days (SOLs) with eight potatoes, he is live the Latvian dream. I have no potato, just dream of potato. So the localised title of the film will be "kartupeļu varonis"? tomandlu wrote: Question about the book - I loved it, but one guy was bitching on some forum that he put it down after a few pages, because there's no way a wind on nearly-airless Mars would have a chance of blowing over a ship or much else for that matter. All I can tell you is that there is enough wind on mars to create huge dust storms and that one of the viking landers recorded 60 mph winds at one point. alt text sums up the explanation for why there are no reality shows about engineers. since it means they have a single cause for the disaster/abandonment. Tekar wrote: Read the book, don't watch the trailer. There be spoilers there. Izawwlgood wrote: The book is hugely funny, and a great My Side of the (Martian) Mountain survivalist read. Keyman wrote: Been 'hand-selling' the crap out of it ever since. It was great. So somebody on here recommended The Martian to me recently. In fact, I know exactly when it was, because I made a note in my phone and the note was date-stamped 15th December 2014. But bugger me if I can find the post anywhere. I can't search for "The Martian" because, even with the quotes, the forum "ignores the common word 'the'"; searching for "Andy Weir" doesn't seem to help either. It may have been one of you four, in which case I apologise for not having got around to it yet and will do so at once! The author is on record saying he exaggerated the force of Martian wind for dramatic effect. I'm cool with it. The Martian is my #1 recommendation. I've gone through over 500 SciFi books since getting my first Kindle. I read the book nearly a year before the publishing house signed a deal with Mr. Weir, back when he self-published the eBook. This is how engineers think. Engineers are the most optimistic people you'll find. Who else do you know that gets excited when something breaks? "I can fix that." Nerd cred: I have signed copy of the hard cover book. Heh - no, not reddit. I'm guessing the guy in question had a bee in his bonnet and got around (I think it was the AVClub). Hmm, not so much dramatic effect as critical plot-point, but that's fine... it's such fun to read. I mean, yeah, it's a 'critical plot point' insofar as that's what causes Watney to be stranded on Mars in the first place, but it's not critical insofar as, say, being an important part of the storyline or really relating to Mars. In the first 5 pages, some kind of disaster happens that strands Watney. If it's a space kraken or a habitat fire or a jilted lover or what, it doesn't really matter relative to the rest of the book. XbHW_TestEngr wrote: The Martian is my #1 recommendation. I've gone through over 500 SciFi books since getting my first Kindle. I read the book nearly a year before the publishing house signed a deal with Mr. Weir, back when he self-published the eBook. This is how engineers think. I thought the "you know the scene in Apollo 13 where they say 'we have to fit this in this'" was going to be a commentary about how that one sentence was a whole chapter in technical detail in the book. Actually, the book for that level of technical detail would be Charles Murray's Apollo, the best book written on the space program if you like learning fascinating technical details. I really hope the eBook isn't on backorder. Potato Hero. I like it! Hmm, okay now I've heard of this movie (and book). Hmm, sounds like the movie Mission to Mars to me... hopefully it will be better! I just can't get over the fact that the guy who did Casey & Andy is getting a movie made by Ridley Scott. (Even latter-day Ridley Scott.) I need to start me a webcomic. Well, that's another one for the ever expanding to-read list. I think the rate of books in is now over double the rate of books out. Might need to have a cull one of these days. Sounds like an excellent topic for a "What If?" IIRC, the fastest winds ever observed on Mars have the Earth equivalent in terms of pressure per square foot exerted to a 10-12mph wind on Earth. They could certainly reduce visibility to nil, but they aren't knocking anything over... I think the worst Martian storm would have tipped maybe a 4 on the Beaufort scale. It is. Plus it has a gorgeous foiled cover in the Crown hardback release.